CALLING ALL BARS: The Underground Punch Pong League is coming to Bristol! London Cocktail Club founder, JJ Goodman, has teamed up with Monin UK to launch a national competition like no other – the Underground Punch Pong League (UPPL). The UPPL is free to enter, and kicks off with the Monin Bartenders’ Challenge Cup; a ‘battle of the bars’ which will travel to 12 locations around the country throughout September. The Bristol heat is taking place at the Big Chill Bar on September 2nd. At each regional heat, eight bars will select a team of two bartenders to represent them. The UK bar scene’s most creative bartenders will compete against each other in a ‘beer pong’-style tournament, with one difference – the beer is replaced with delicious punch. Each team will draw a Monin syrup flavour at random, which they must then use as the foundation for creating their signature recipe. 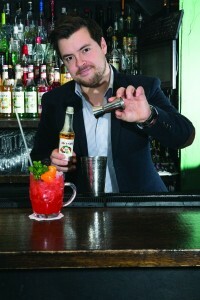 The successful teams will compete for a coveted place in the grand final at the Covent Garden Cocktail Club during London Cocktail Week, on Monday 7 October. As well as eternal fame and glory, the winning team will also bag a day trip to Paris for four, where they can visit some of the world’s greatest cocktail bars and sample some fantastic French food. To enter your team into the Monin Bartenders’ Challenge Cup and for more information on the Underground Punch Pong League, visit www.punchpong.com. The dates and locations of the regional heats are as follows and all regional heats start at 5pm.